New agenda view style ("Settings", "Display and Use", "Agenda view", "Style"). 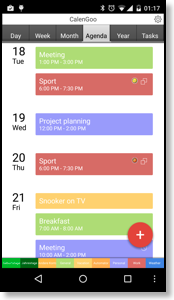 New option "Settings", "Display and Use", "Week view", "Red line marks current time" to show a red line for the current time in the week view (relative to the start times of the events, i.e. you can see by the line which event starts next but not which events are already over). Files can be attached to tasks. The year view marks the days with the event colors instead of just the calendar colors. Under Nova Launcher the date is now displayed on the icon.